The new OMEGA™ VP and VPT Series self-regulating, fully grounded immersion heaters are ideal for insertion into small tanks, vessels and appliance as well as compressors, oils, fluids and plating cells. Available in stainless steel of PFA sheath for corrosive environments, both models are shatterproof, grounded with a three-wire, 5' (1.5 m) long power cord and have a solid state heating element. 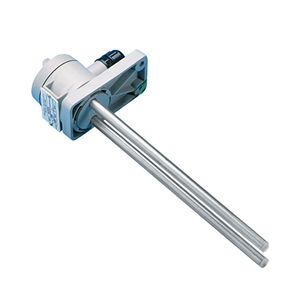 Best suited for use in applications where heating, excess temperature protection controls and regulating components must be fitted into a small space, these heaters are lightweight, easy-to-handle, rapid heating (maximum temperature is 212°F (100°C), units that eliminate any danger of overheating. Auto-stabilized temperature prevents hot spots, thereby ensuring uniform heating. Accessories include a ½" NPT Kynar screw plug adaptor which holds the heater securely in place, and a polypropylene mounting flange so the heater can be suspended vertically into small vessels.